TAWBOX has relied on disguise media servers to drive stage and IMAG screens for major performances by English grime artist Stormzy and British singer-songwriter Rita Ora, throughout 2018. TAWBOX specialises in all elements of creative direction and production for music, concert touring, television and fashion and was founded by Creative Director and Choreographer Amber Rimell and Creative Director and Production Director Bronski. “We have always been driven by video and the aesthetic and how dynamic it can be on stage,” said Bronski. 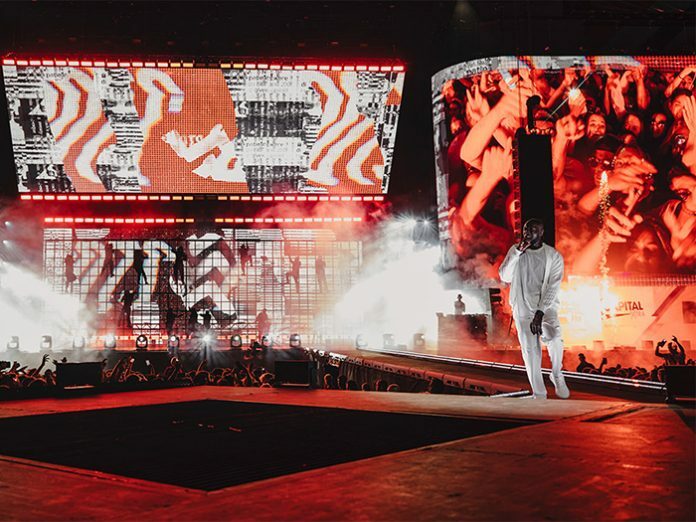 “Our first real venture was in May 2017 when we programmed the entire Stormzy Gang Signs and Prayer Brixton Residency show in disguise starting at a very early point in the design process.” After that successful show TAWBOX was sold on using disguise to handle the increasing number of outputs required for the diverse show demand for Stormzys shows and festival appearances. As a result, TAWBOX invested in two disguise solo media servers in early 2018. After a successful run of summer shows using solo with Stormzy, TAWBOX were able to use the flexibility of the server for the wide range of summer shows for British pop star Rita Ora. A large portion of the shows were for live TV performances. “For Rita Ora’s performance on The Jonathan Ross Show, we had three feeds of content projected onto three sets of domestic blinds over a pool of water. A fair share of perspective, direct and feed mapping were utilised for this, and we were able to manipulate the mapping with ease,” Bronski reported.